wow<3 I always love your drawings *O* they are so BEAUTIFUL!!! lovely drawings! You're so talented! That is a terrifyingly accurate drawing. Well done. Your drawings never cease to amaze me!!! oh my, you're really good eki! Very talented! this is so amazingg!!! * ^* you are a very talented artistt ! You are so good at drawing!!! You are an amazing artist, too! Can i have your hands? ^^ Amazing drawing!! Wow, it looks so amazing!! ♥ A pretty perfect rendition! That is amazing! You are SO good! Do you work in graphic design? Oh my - that's so realistic~! I loved your drawing! I like how you do the shadows and lightnings, awesome style *3*! wow, you have a great talent! Amazing Eki! This is gorgeous! mmm I love skecthing too, I've never have a thought that you're kind of artie! and more, morrigan is my favorite character from darkstalkers/vampire savior. awee I still remember her deadly combos till now. ahahaha...luv it! Oh God! You are so talented!! I can´t belive!! 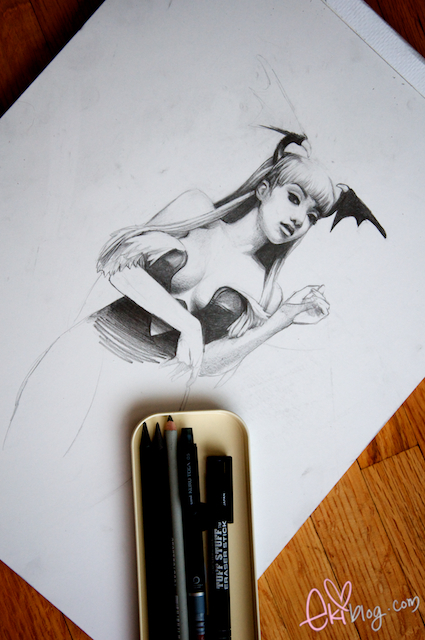 She looks so real in your sketch; the shadows are perfect! Damn, you are beautiful AND talented. That looks awesome~!